“IN THE CASE of the struggling young Christianity, for example, the Jews, quick as a flash, began hanging onto its coattails. Consider Paul, properly called Schaul, who was a rabbinical student. That Schaul first chose the Roman-sounding name, Saulus, and then had himself renamed Paulus gives cause for thought. Still more, the fact that in the beginning he persecuted the fledgling Christian community with first-rate ferocity. I don’t know: Mass murderers who later become saints — is that not too much of a marvel? Indeed, the Jew Weininger supposed that Christ had also originally been a criminal. But, my God, a Jew could say that a hundred times, and it still need not be true on that account. “If it depended on mere possessions,” he returned, “they would be justified. Someone named Goldstein once boasted that the Jews administer the spiritual property of the German people. A pity that he didn’t add how they administer it. “Vagabonds of the spirit,” I threw to him. “Everything remains as of old,” he nodded. “There have been popes of Jewish blood. Also there has seldom or never been a shortage of other dignitaries of the same descent in the Church. Was that which they stood for Catholicism? No, it was Judaism. Let’s take just one thing: the selling of indulgences. The very essence of the Jewish spirit. We are both Catholics, but dare we not say that? Are we really supposed to believe that there has never been anything in the Church with which one can find fault? Just because we are Catholics, we say it. That has nothing to do with Catholicism. We know that Catholicism would have remained intact even if half the hierarchy had consisted of Jews. A number of sincere men always held it high, though often only secretly, many times even against the pope. Sometimes there were many such men, sometimes few. “The investigation of the Jew and his activities should have been the alpha and the omega of our historians. Instead, they investigate the bowel movements of the past. “Karl the Great favored the Jews at every turn. It seems to me that his slaughter of the 4,500 Saxons at Verden — the best German blood — and his Jewish advisers had something to do with one another. “The notorious insanity of the Crusades bled the German people of six million men. Finally the Hohenstaufen, Frederick II, succeeded through mere negotiation, without striking a blow, in securing the Holy Land for Christendom. What did the Curia do? Full of hatred, they hurled the ban of excommunication on Frederick and refused to recognize his treaty with the sultan, thus neutralizing his great success. It seems that, to those pulling the strings, the incidental bloodletting was more important than the avowed objective of the Crusades. “At last came the Children’s Crusade. Tens of thousands of children sent against the victorious Turkish army, all to be destroyed. I can’t believe that the idea for that absurdity originated in a non-Jewish mind. I am always reminded of the murder of the children of Bethlehem and the slaughter of the Egyptian firstborn. I would give anything for a photograph of the priest who preached that Crusade, and his flunkeys. “Since those who are responsible for the trouble will have been discovered!” I cried. “Since the disguised Hebrew, together with his cuckoo eggs, will have been thrown out of the Christian community! He has set not only the Egyptians but also the Christians against one another so that ‘they shall fight every one against his brother, and every one against his neighbor,’ and he is still at this game. He works from the outside, carefully building his pitfalls and making his destructive influence felt in the press. But he also works from the inside, where he is even more dangerous, in the mask of the Christian minister. The Christian confessions swarm with Jewish and half-Jewish clergymen, the Protestant denominations even more so than the Catholic. They already feel so sure of victory in the Protestant churches that in Dresden a certain Pastor Wallfisch had the impudence to announce publicly: ‘I am a Jew and will remain one; yes, now that I have learned the Christian beliefs I have become more than ever a true Israelite.’  And in Hamburg a preacher named Schwalb said: ‘I consider myself a genuine Jew and have always considered myself thus’. Where that sort of thing is possible, Christianity might as well let itself be buried. “Yes, even Luther was taken in by the ‘chosen people,'” I replied. “He looked upon the Old Testament as divine revelation. He approached the book with infatuation, convinced that it could contain nothing but sheer preciousness. Then he began wading into the vile thing. After a few steps he blinked his eyes, bewildered. He was stunned. That just couldn’t be so! It must have some other meaning! And so, with perfectly honest intentions, he read between the lines what simply wasn’t there. Everywhere he managed to see allusions to Christ, although nothing could be farther from the Jews’ actual thoughts on the matter. Their Messiah is no ‘lamb’s tail,’ Heine jeered at Christ, no scorner of earthly existence. On the contrary, their Messiah is a brutal dog who will conquer the earth for his Jews; he is the ‘prince of this world.’ Page after page it says: ‘Ye shall eat the riches of the Gentiles, and in their glory shall ye boast yourselves,’ or ‘Ask of me, and I shall give thee the heathen for thine inheritance, and the uttermost parts of the earth for thy possession.’ One of these is a statement of a ‘divinely inspired’ prophet, the other a ‘deeply spiritual’ psalm (Isaiah 61:6, Psalms 2:8). “Credulously, Luther viewed everything in a rosy light. This became easier for him when, in the middle of the great morass, he came to passages like: ‘Ye will have no permanent existence among the nations, and the soles of thy feet shall find no rest,’ and ‘Ye will be an abomination among all peoples.’ Compassion seized him. “The Jews,’ he thought to himself, ‘have become untrue to their godly doctrine, but they will again find their way home to it.’ It never occurred to him that these direly threatening sermons served only the purpose of holding the Jews to their course. “No, you are right,” he said. “The Jew often plays the role of a benefactor only in order to accomplish his destructive aims without notice. It’s always been that way. Otto Weininger, Geschlecht und Charakter (Vienna and Leipzig, 1903). Moritz Goldstein, Kunstwart, March, 1912. Giordano Bruno, Spacio della Bestis Trionfante (1584). In his lecture in 1894, entitled Umpires of the Jewish Question. In his farewell sermon in March, 1894. 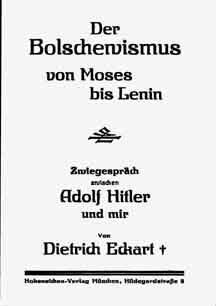 You’ve just heard part three of of Dr. William Pierce’s translation of Dietrich Eckart’s Bolshevism From Moses to Lenin, read by Vanessa Neubauer. We’ll conclude our series based on this important, insightful work next week — right here on American Dissident Voices. This is a fascinating book and it is a delight to hear Ms. Neubauer’s voice! Thank you all for the work you do.